Creating kindness is a serious business requiring concentration. 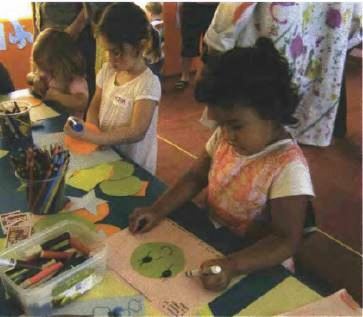 Karuna Hospice Service’s desire to encourage a kindness culture in the community was supported by the Queensland Performing Arts Centre’s 2008 “Out of the Box Festival” in Brisbane for children between the ages of three and eight. A series of art workshops under the banner “It’s Cool to be Kind” was held in the foyer of the Lyric Theatre over the six-day festival in June.